Whoohoo!! These are the people that make it all happen!! Boom! There she is, the boss. Fun Fact #6 She really doesn't like peas...or tomatoes. Seriously. On another serious note or two, she never ever wakes up looking like she does in this photo (thank you Hanri Human for the pic), and she is a serious believer of loving the body you're in and just being you! Growing up as an avid Spice Girl fan she fully believes in Girl Power and that women should be building one another up with their strengths, whatever that might look like. Like Maya the Bee, this Maya is the bees knees!! She's so cool, she's like Cher and Madonna and only goes by one name. Haha! No, totally kidding. She is actually also known in the industry as Marnél Toerien the make up artist, she is Janita's little sister and the nickname was given to her by her grandfather. She is our studio manager/life of the office and is your first point of contact when you mail us. Don't be shy, say Hi Maya! 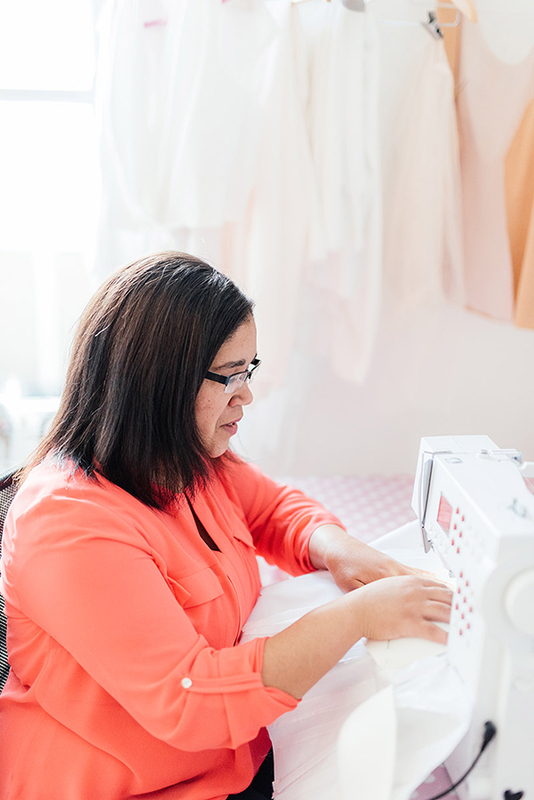 Mellissa's love for sewing didn't start at college when she studied at the Cape Peninsula University of Technology, it started early on when her grandmother taught her how to bead evening dresses. Today she applies the wisdom from her grandmother teachings with modern sewing techniques to sew the endless meters of tulle on ballgowns or adjust a slight bust dart on exquisite silk bodices. Philzain's hands are responsible for the intricately beaded details and finishing on all our dresses. If there is a custom beaded bodice then Philzain placed and sewed every single bead with precision, if lace needs to seamlessly overlap in order to look like it was woven to the shape of the figure then Philzain is the one who will applique every tiny leaf to flow into one another. The newest member to our team! Rozita studied Fashion Design at Fedisa and is an all-rounder when it comes to garment construction and pattern making. She will also be leading the team as we develop our ready-to-wear collection so keep an eye out for new coats, jackets and slacks for winter!